It seems like just yesterday that we were introducing the all new 2013 Acura ILX. But time flies and the 2014 ILX is already on sale! With upgraded style, comfort, and audio features, among others, the ’14 ILX is bound to hang on to its designation as “the only luxury model on the top ten list of Generation Y car shoppers” (according to J.D. Power and Associates). Read all about it in the official Acura press release below. Then visit Butler Acura at exit 19 in Ashland to experience one for yourself! The 2014 Acura ILX luxury sports sedan goes on sale tomorrow with a host of new standard features, further strengthening the gateway vehicle to the Acura brand. Introduced as an all-new model for the 2013 model year, the 2014 Acura ILX offers increased value on a luxury scale with eight new standard features to enhance its curb appeal, interior comfort and overall driving enjoyment. The ILX is the only luxury model on the top ten list of Generation Y car shoppers according to J.D. Power and Associates, and the 2014 ILX gets upgraded 17-inch alloy wheels, while the interior receives new leather seating surfaces and leatherette door liners, an eight-way power driver’s seat, heated front seats and a Multi-Angle Rearview Camera. The ride experience is further enhanced by a new audio-system subwoofer and an Active Noise Cancellation (ANC) system that are standard features on the 2014 ILX, which starts at a manufacturer’s suggested retail price* (MSRP) of $26,900, an increase of just $1,000. Three advanced powertrain choices are available for 2014 ILX, with a standard 2.0-liter inline 4-cylinder engine that produces 150 horsepower. Paired with a Sequential SportShift 5-speed automatic transmission, it has an EPA ** city/highway/combined fuel economy rating of 24/35/28 mpg. For a more dynamic driving experience, the ILX can be equipped with a close-ratio, six-speed manual transmission matched to a 2.4-liter engine generating 201 horsepower, and earning an EPA ** city/highway/combined fuel economy rating of 22/31/25 mpg. 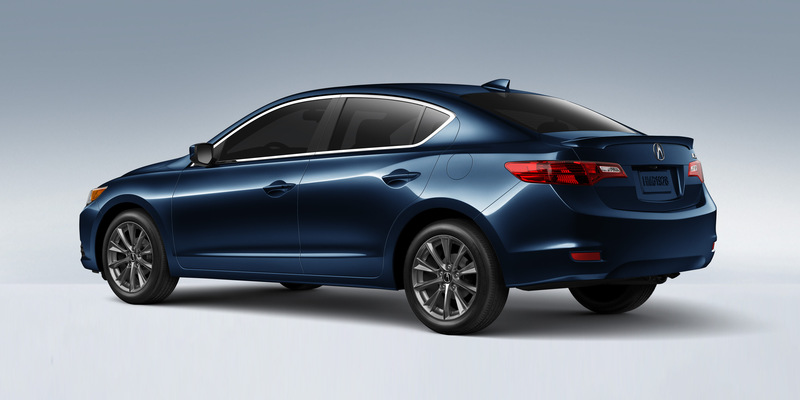 Information on the 2014 Acura ILX Hybrid will be announced at a later date. The ILX uses 59 percent high strength steel (HSS) in its body structure for enhanced protection and chassis rigidity. The chassis utilizes an advanced, fully independent MacPherson strut front and multi-link rear suspension system and Acura signature Amplitude Reactive Dampers, which offer superior ride comfort and precise handling. In addition, Motion Adaptive Electric Power Steering (EPS) is used for excellent steering feel and improved fuel efficiency. The high-quality, well-appointed interior is smart, spacious and sporty. It offers a number of convenient features including a standard Keyless Access System with smart entry and pushbutton start, along with Pandora® interface and SMS text message function for easy connectivity. As before, a Premium Package and Technology Package are both available. Acura’s belief in “Safety Through Innovation” is the foundation for the brand’s commitment to leadership in safety, and accordingly the ILX has a wide range of standard active and passive safety features, including Advanced Compatibility Engineering™ (ACE™) body structure. It received a 2013 TOP SAFETY PICK rating from the Insurance Institute for Highway Safety (IIHS), attaining a score of GOOD in all four Institute tests, including the rigorous roof-strength test. The Acura ILX is manufactured exclusively at the company’s state-of-the-art Greensburg, Indiana plant using U.S. and globally sourced parts. About Acura Acura offers a full line of technologically advanced performance luxury vehicles through a network of 272 dealers within the United States. The Acura lineup features seven distinctive models including the RLX luxury flagship sedan, the TL performance luxury sedan, the TSX Sport Wagon and sedan, the ILX compact luxury sedan, the RDX luxury crossover SUV, the ZDX four-door sports coupe, and the soon to be released all-new MDX luxury sport utility vehicle. **Based on 2014 EPA mileage ratings. Use for comparison purposes only. Your actual mileage will vary depending on how you drive and maintain your vehicle. 1 ** Based on 2014 EPA fuel economy ratings. Use for comparison purposes only. Your actual mileage will vary depending on how you drive and maintain your vehicle.